This is something i am waiting with my tongue hanging out!!! Can't believe it. 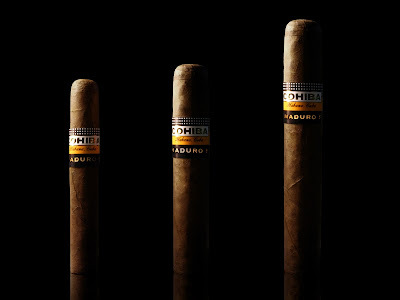 Cohiba is making Maduros. The new linea Maduro 5 is basically three different sizes wrapped in Maduro wrapper aged for five years. I will be the first in line when these arrive... If someone has some more info, please leave a comment. 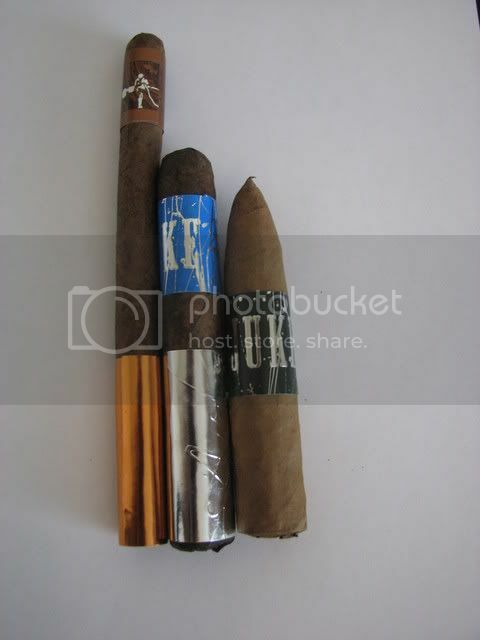 I created a new page for the complete list of cigars i have in my humidor. The list view left there is only the top ten rated sticks. I had my first Bucanero while watching AC Milan beat the sh@t out of Liverpool in the soccer European Champions League final. What a great game, what a great cigar. The dark maduro wrapper of the el Capitan belicoso petit give you anticipation of dark and full flavors to come. The scent unlit is full of dark cholate and maybe a hint of mint. Quite an extraordinary fragrance anyway. I liked it a lot. When lit the truth about the cigar reveals itself. Depsite the looks the flavor and body are lightto medium, not dark and full. Easy draw, excellent with medium body combined. The first third of the cigar was giving out sweet flavor with a hind of maybe cherry in it. Every draw was followed by a delightful after taste. Second third of the cigar created more flavors. The smoke became strudier and changed more buttery and creamy. Also the only defect in this cigar gave it self up: the strong veins in the wrapper caused uneven burn, which required some attention away from just enjoying the smoke. Overall, the Bucanero el Capitan Maduro Belicoso Petit is a very enjoyable cigar, does not demand a lot from the smoker but gives plenty. Thumbs up. Oh my, oh my. Just got my cigars from the dominican Arganese Cigars. A box of Maduro Chairman Coronas and a 13 stick saple pack with multiple blends and wrappers. I think i am going to have some trouble deciding. Today I received a "minor" gift from my friend Richard. 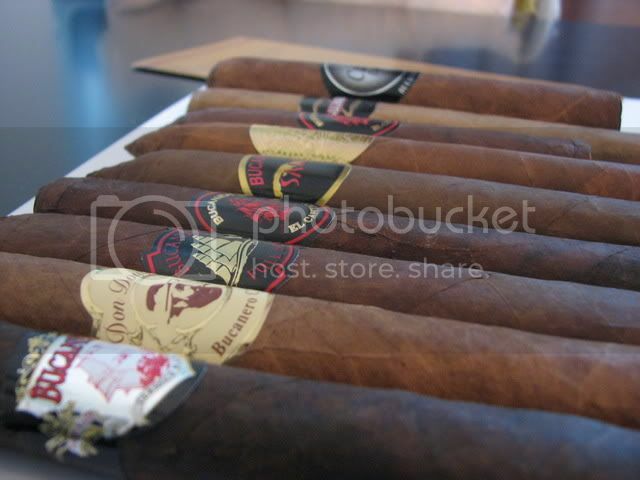 We know each other on the cigar forum Club Stogie only. There are lots and lots of great people around there, who all share the same passion. I will review them as soon as i get some quality time with myself. I do not want to waste them in haste. 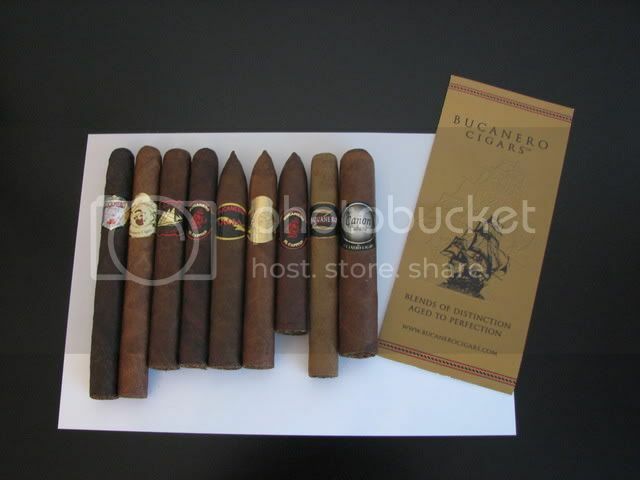 And may i say customer service @ Bucanero was excellent, Robert is a good man. Today i got the Lighter i've been waitin' for. to my pleasure, i found it waiting for me in my office mail locker, when i arrived. For this i have to thank my American Friend Paul Briganti at the Vintage Chic' Cigar LLC. Best customer service i have ever had! Today i experienced my most intense cigar yet. To enlighten you of the background of this situation i first must tell you a couple of details. This whole week has been a very terrible one: i had the flu, my wife scrached up my BMW (i don't blame her thou) and i have been working overtime to get the monthly Profit & Loss reports to our corporate management. I took my car to the shop, got the reports done and thought that i will whipe it all away with a reward cigar. and indeed it was a reward, like which i would have never guessed it to be. At this point i have to remind you, that my reviews are not based on any expertise but my subjective feelings and thoughts of each cigar. So, I walked to my humidor and grabbed the Cuban Montecristo 3. This corona sized cigar is close to perfect in appearance and structure with smooth outer surface and roasted honey color. 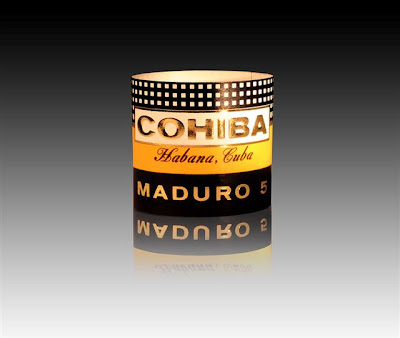 Its unlit flavor clearly stated "i am a full-bodied Cuban cigar". From the first draws it felt like an easy one. The first third of the cigar gave away medium strong flavor with hint of citrus fruit in it, promising a great experience. The second third turned out to be the WOW-moment of this cigar. the aroma built into a full sample of Cuban craftmanship, flavor now changing from bitter citrus to sweet, resembling a sweet tasting red wine with medium roast coffee. this is atleast as i tasted it. In the mid section of the cigar, i was overwhelmed with two separate memories from my past. First it reminded me of my honeymoon. The salty warm breath of the ocean wind on the beautiful white beaches of Mauritus. From there i jumped to my granfathers cottage in the middle of nowhere in southern Finland. Beautiful nature, birds singing up in the trees and a whirl of smoke rising from the chimney of the sauna. This all i experienced sitting out on my balcony, smoking the best cigar i have tasted yet and looking down towards the park in our backyard. A little bit expensive but highly recommendable. 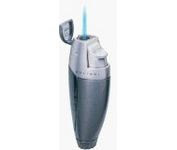 I just purchased a new torch from eBay. Colibri Talon 2. Price USD 20 + postage USD 13, total USD 33. not bad in Finnish price standards (about EUR 25). Excellent service from the seller: Paul Briganti (my new friend) at the Vintage Chic' Cigar LLC. Quick reply, quick delivery and very very friendly service. Now I am just waiting to get the torch to get something torched. a few days has passed since my last input here. That is because i have actively been surfing the online cigar forums. I have to say, that there are a lot of them out there, but only few are worth the effort and the forum to visti depends entirely of the view desired. 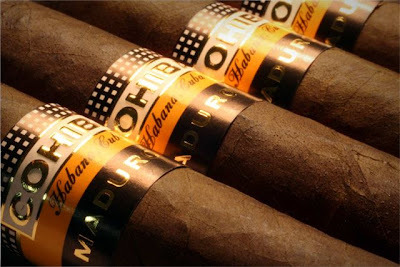 If you are looking for peers in the world of Cuban cigars, friendsofhabanos.com is the choice. For great universal discussions cigarsmokers.com and clubstogie.com are great. High member counts and real expertise on all the above forums. If you have additional online forum or store recommendations, please hit a comment and i'll be checking them out. 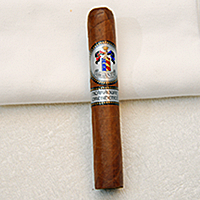 This little cigar can easily be recognized as a dominican. Sweet and light in unlit fragrances and while burning, light aromas and smooth taste make it an easy pick for any day of the week. Yet, when reaching the final 3rd of the cigar, some flavours from a nigaraguan world can be found, stronger and more detectable than in dominicans usually. The worst flaw in this cigar is, that its loose structure too easily gives away aroma and flavor. When smoking La Flor, you have to do it slow enough. Otherwise the cigar will heat up too much and it becomes somewhat bitter in taste. I have found the best aroma so far... Montecristo Joyitas, as tiny as it might be, is full of flavor and taste, suited to fit my taste. this cigar is firm in structure and has a smooth outer wrapper, beutiful roasted honey in color and suitable for every day smoking due small size. The first smell of it unlit, did not promise anything extraordinary, but did not dissapoint either. However, when lit, the carneval of flavours made my tongue pop. The cigar began similar to a smooth, easy tasting dominican, but when furhtering the experience, turned out to be a full blooded cuban delicacy. very full and round in flavor, i found hints of fruits and cherry while working my way thru. I recommend. When i smelled this unlit cuban cigar, i was given expectations to wait for a flavour similar to Partagas Petit Corona Especiales. And in a lot of ways the Milles Fleurs is no differend from the PPCE. Milles Fleurs however created more hints of various flavors and aromas in my mouth. I could taste flavours almoust described as corn and old leather. That is probabaly the closest i can describe what i felt on top of my tongue. This one also got my mouth watering like Niagara Falls. Inspired by the good experience i had with the previous nigaraguan cigar, i tried to find another as tasty as it was. However, this cigar did not fill my expectations. From Bugge's own Nigaraguan Selection, this Senjoritas was blunt both in aroma and in flavor. Unlit and on the first couple of draws, hints of pepper could possibly be identified. Towards the end the taste almost made your tongue numb, but mayde some berries hidden in the numbness. I plan not to but these cigars again. they just are not my cup of tea.